Running is one of the best forms of cardio exercise there is, helping to promote both weight loss and strengthen your most important muscle – the heart. Sometimes it can be difficult to train outside, lack of footpaths darkness, temperature etc. If you can find the space it makes sense to keep a treadmill at home. Some models can even fold up for storage under a bed, or in a cupboard. This guide will walk you through the considerations to make before heading out to buy your treadmill. Aims: Without knowing what you want to achieve you could end up either spending far too much on a Treadmill that is too powerful. Or, worse, a lot of money on a machine that cannot keep up with you. Motor If you are a serious runner, or have a goal to be, then you need to be looking at Treadmills with powerful motors capable of running at 12mph. The minimum motor size should be about 3 CHP. CHP stands for continuous Horse Power, and is the level of sustained output. Some motors might claim 3 HP but this would be a burst of speed. CHP is where the motor will run for an hour or more without a problem. Visit our full guide to treadmill motors here. Mid Range runners, would be about 2-3CHP this would be more of a jogging speed. These would also be suitable for using for long distance training where speed is less important than endurance. Occasional exercise use could get away with motors at under 2CHP but we would not recommend going under 1.25 CHP, these are simply not powerful enough. Its worth pointing out that these ratings are for average weight users. If the treadmill is to be used by someone over 230lbs then you should consider moving up a power rating. Speed Along with the motor the next thing is maximum speed. If you are not intending to run at 12mph then a slower treadmill would be OK. If you want to run interval training then you will need a machine capable of the bursts of high speed required. Generally entry level machines are capable of about 8-10mph, while higher end models can go to 12mph. Runner Weight All treadmills will be rated for the weight of the user. If you are under 225 lbs you won’t have a problem with any machine. If you plan on having someone heavier on the machine then the rule of thumb is to add 50lbs to the maximum user weight. This ensures that you are not over stressing the machine and reducing its life. Incline Most treadmills can be set on a slope to increase the level of the workout. If you want to be able to vary the workout mid session then you will need an automatic adjustment. Alternatively you will need to stop the machine and change the settings manually. Size The sizes very considerably in width and length. You can find tracks as narrow as 16″ up to about 20″ wide. Lengths vary from 42″ upto 62″. The size of the track can have a huge impact on the quality of the exercise. If you are planning on running fast, or you are on the tall side then a longer track of 56″ or more, with a good wide 20″ area to land the feet. Less than this and you will be thinking more about foot placement than running. Treadmills designed for walking or light jogging can be of any width or length and can be more dictated by budget. Cushioning This really applies to running machines, at slower paces you don’t need to absorb so much impact. 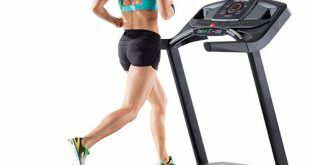 If you are planning to run on your treadmill then the cushioning will absorb a huge (upto 40%) of the impact from the steps. Not only that but there is a dramatic reduction in the noise from running with better cushioned machines. 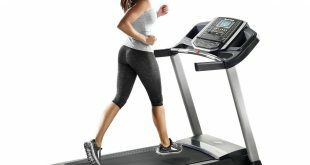 The cushioning is in two parts, first the belt is designed to soak up some of the impact, then the bed of the treadmill is supported on a number of suspension struts. These struts work like a car suspension soaking up the hits. On higher end models this can be adjusted so to make the landing softer or harder. Maintenance All tracks will wear out and need some level of looking after. For a longer lasting surface look at 4 ply tracks over 2 ply versions. Some tracks will require lubrication. This can be a tricky process involving spreading a layer of oil evenly under the track periodically. This can be done yourself or you might want to call in a technician as it can involve loosening the rollers. On the subject of rollers, these do have a roll to play in looking after the track. The wider the roller the less curve and stress it applies so it leads to a longer track life. Wide rollers are over 2.5″ upto 3″. Programs: Virtually all treadmills have some built in programs that can be followed. These can vary based on your workout objectives, from “Fat Burn” to cardio and endurance training. For a treadmill 12- 15 programs is usual. I would not base a choice on the number of programs however as if there is not one you like then it is usually possible to add your own. With the new generation of treadmills on the market there is now a move to virtual tours. These are worth looking into. Your treadmill comes with a large flatscreen taking you on a tour of various landmarks or famous runs such as the London Marathon route. These are often last minute additions to the Treadmill to boost the price. Fans are generally useless on treadmills. We would recommend buying a portable fan that can be placed where you want it. Built in MP3 can be useful, but again the sound quality is not as good as you would get with a pair of bluetooth ear phones. Like programs I would not spend extra on these. Folding Treadmills: At the lower end of the market treadmills are often listed as being portable. This is generally because small light treadmills are very cheap to produce. If you must have a portable treadmill please check that it matches up with your workout objectives. Warranty: There is no clearer sign of the quality of a treadmill than the manufacturers Warranty. If someone is producing a high end reliable product then in reality it costs very little to offer extended, even lifetime warranty. If the treadmill is never going to break down then it makes sense. Watch out for models with short warranties, a year or less. If the manufacturer does not expect their treadmill to last this long why should you? I hope this guide has helped you, the first place to start is doing your research, planning your budget then checking the reviews. We have some excellent treadmills reviewed on this site, why not start here?